GALION — Galion Community Theatre’s production of Disney’s “Newsies” brings an abundance of local talent to the stage, some familiar and others appearing in their stage debut. This production is being performed by actors ages 10-20 years old. Set in turn-of-the century New York City, “Newsies” is the rousing tale of Jack Kelly, a charismatic newsboy and leader of a band of teen-aged newsies. When titans of publishing raise distribution prices at the newsboys’ expense, Jack rallies newsies from across the city to strike against the unfair conditions and fight for what’s right! Featuring the now classic songs “Carrying the Banner,” “Seize the Day,” and “Santa Fe,” Newsies is packed with non-stop thrills and a timeless message, perfect for the whole family and every audience. Connor Moreton as Jack and Rachel Jarvis as Katherine Plummer lead a cast of more than 50 players, supported backstage by a huge team which includes cast parents! Last night’s performance was well-attended, with three more performances planned this weekend: Saturday at 2:00 p.m. and 8 p.m., and Sunday at 2:00 p.m. Tickets are still available to purchase at the door. Visit Galion Community Theatre’s web site at galiontheatre.org for more information about Newsies as well as upcoming auditions and productions. Sign up to receive e-mail updates about events at GCT. Erin Miller | Galion Inquirer Galion Community Theatre production of “Newsies” showcases local, young talent. 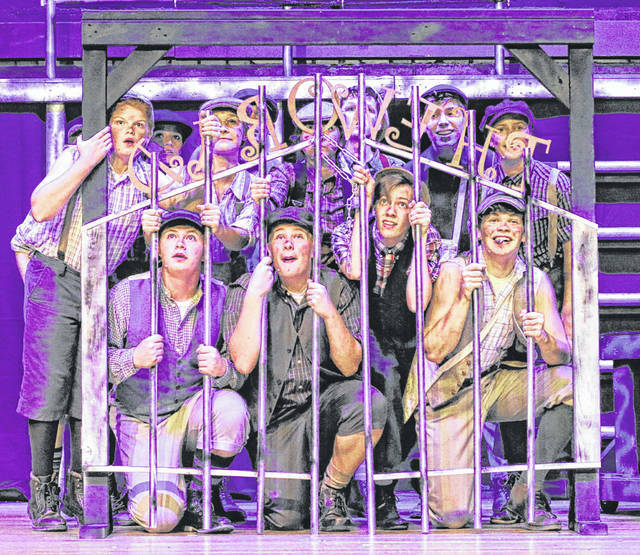 https://www.galioninquirer.com/wp-content/uploads/sites/38/2018/07/web1_Newsies-1.jpgErin Miller | Galion Inquirer Galion Community Theatre production of “Newsies” showcases local, young talent.